Is your kid bored with all her board games? 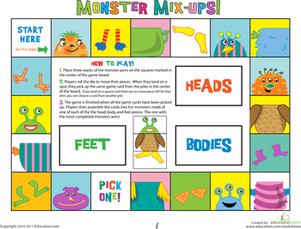 The silly mix up monster game is sure to please any young learner. Kids get practise with counting and following directions as they make their way across the board and collect monster head, bodies, and feet. At the end of the game, they assemble the monster bodies any way they like, and the player with the most complete monsters wins! Mix things up during learning time and build these mix-and-match blocks for your preschooler! 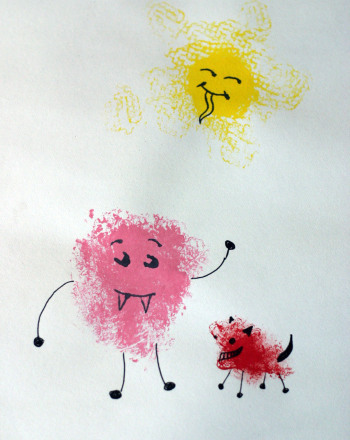 Kids print their own smudges, then turn them into silly monsters that are sure to bring lots of laughs along the way. 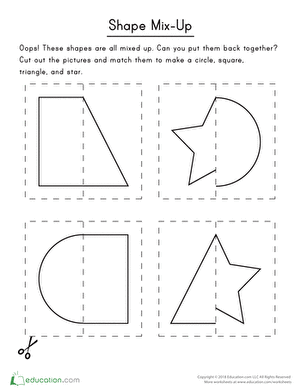 Kids cut out pictures to put silly, mixed-up shapes back together on this prekindergarten maths worksheet. In this fun printable board game, kids toss pennies onto the board, trying to get them to land in the penny toss monsters' mouths. These letters are mixed up, and if your child knows the ABC's, he can put them in the correct order. Rearrange these last few letters into their alphabetical order to finish up this worksheet series! 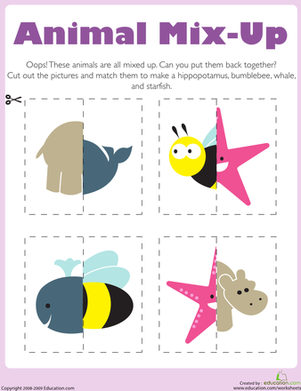 Kids cut out pictures to put silly, mixed-up animals back together on this prekindergarten science worksheet. Let your preschooler discover simple science with a lesson on what colors mix to make green. Can your child think of other colors that mix to make new colors? Packed with protein and energy, trail mix is a great way to keep your kid energized. What two colors mix together to make pink? Let your preschooler discover the wonder of colors with this fun worksheet. Does your preschooler know what colors mix together to make purple? Let your child discover the magic of colors with this bright and educational worksheet.